Pretty much, I hate that I really love it, which is actually funny because I used to hate it. Like, realllllly hate it (thanks worst hangover of my life). I don’t know when I started to like it again, but I’m pretty sure it had something to do with taco and margarita night at a local joint down the street from my college apartment. Speaking of tacos… they sounds incredible right about now. I reallllly, REEEAALLLLLLLY love tacos. Any and all tacos. I’m not biased when it comes to tacos. Or margaritas for that matter. Whatever the reason, I am super glad that tequila came back into my life. Many quality girl’s nights have been fueled by tequila (and chips and gossip). I started getting the feeling that CJ was feeling left out of all the fun… by fun I strictly mean tequila. How can the man not love corn chips and gossip?! It’s almost like we have nothing in common. He does love food though, so I thought that cooking his favorite thing in the boozy stuff would do the trick. I was right, he had a blast eating this up. And I had a blast licking the pan (kidding… sort of). Preheat the oven to 325. In a large dutch oven, heat half of the cooking fat over medium high heat. Rub a sprinkle of salt, pepper, and chili powder all over the short ribs. 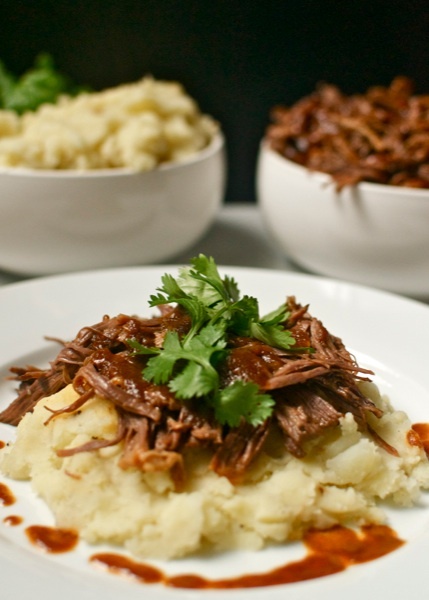 In batches, brown the short ribs on all sides and then set aside. Add more fat as needed to brown all of the meat. To the pan, add the chopped onion and cook until the onion begins to soften, about 5 minutes. Add the garlic, chipotle powder, and cumin to the pan, stir, and cook just about 1 minute. Carefully, pour the tequila in and stir to deglaze the bottom of the pot. Next, stir in the tomato sauce and stock. Gently wiggle the short ribs back into the pot, along with the jalapeños and dates. Remove from heat, cover, and transfer to the preheated oven. Cook for about 3 hours, until the meat is very tender and falls off the bone. Once done, remove from oven and remove the lid so that the meat can begin to cool. Carefully, transfer the meat to another dish. With a slotted spoon scoop out the onion, jalapeños, and any loose bones and discard. Do your best to skim off as much fat form the remaining liquid as you can. Pour the liquid through a fine mesh strainer into a pot. Bring the liquid to a simmer, pour an additional 2 tbsp into the sauce, stir, and let simmer until it’s thickened a bit. Meanwhile, remove any bones from the meat, along with any excess fat or silver skin. I prefer to shred the meat so that it can really get covered in the sauce. Once the sauce has thickened to your liking, serve atop the meat. Tequila and I have a love-love relationship haha!! I love everything tequila! Thanks for the recipe! 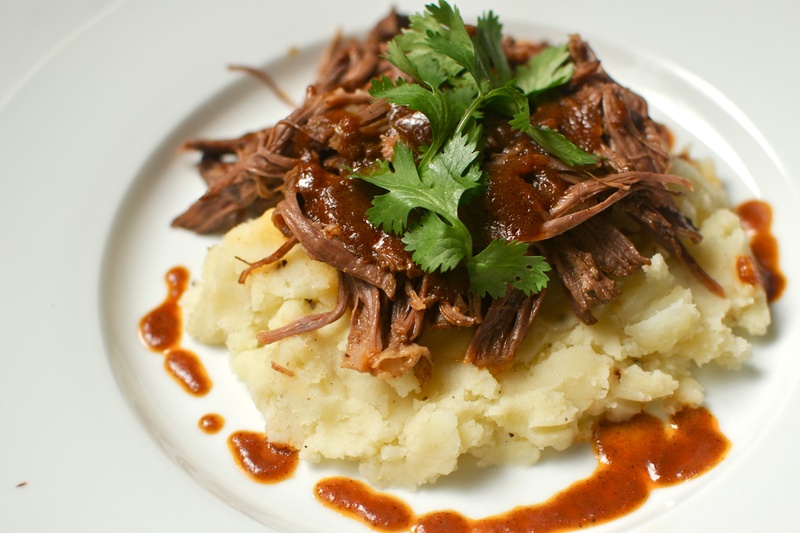 Two of my favorite things combined-Tequilla and short ribs!! I will absolutely be making this recipe soon. Quick question-You state to “pour an additional 2 tbsp into the sauce”. Pour an additional 2tbsp of what exactly? I looked through the ingredients and didn’t see any type of flour or thickening agent listed. I am really good at not seeing things right in front of me so sorry if its listed 🙂 Thank you!! oh my gosh! haha 2 tbsp of tequila!! Fixing that now, thank you! UNREAL!! I can’t wait to try these again! 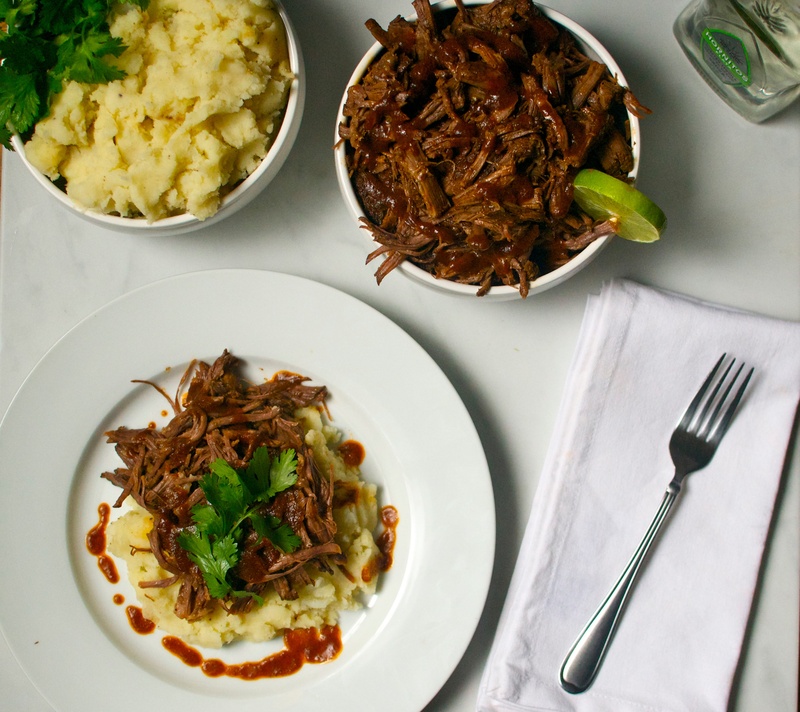 Thanks for finally writing about >tequila braised short riubs | girlmeetspaleo <Liked it!